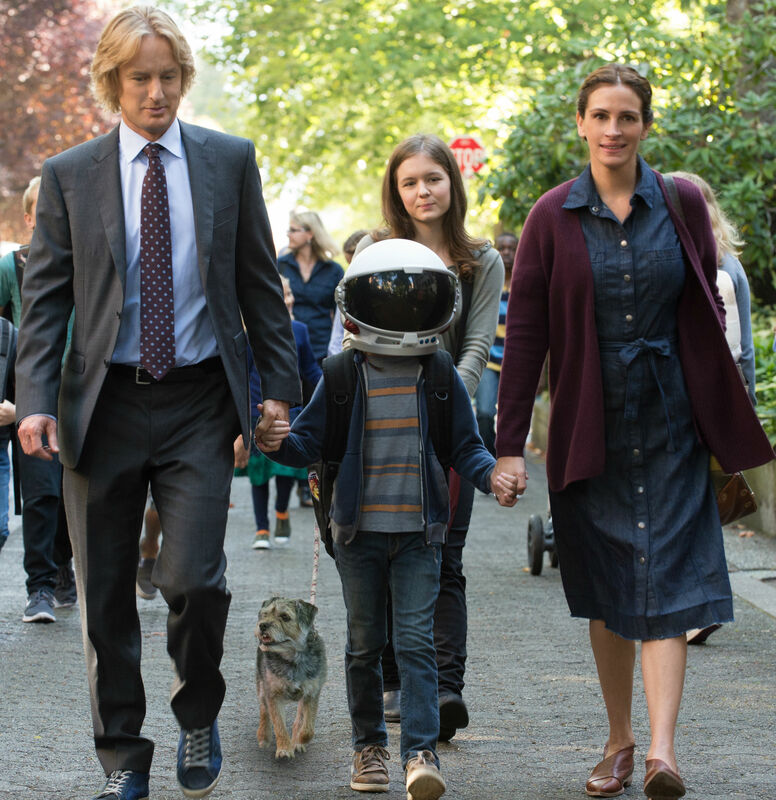 Stephen Chbosky directs Julia Roberts, Owen Wilson, Jacob Tremblay and Izabela Vidovic in Chbosky’s second adaptation of a NewYork Times best seller in Wonder. Previously Chbosky directed his own novel “Perks of being a wallflower”. Wonder is a novel by R.J Palacio. 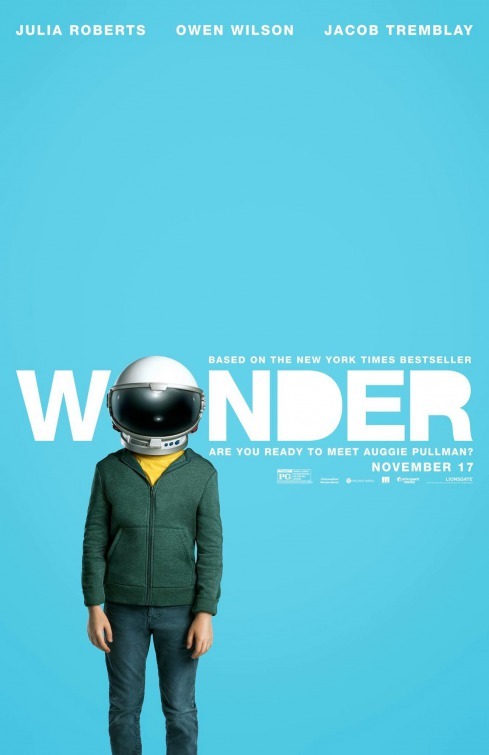 The story of Wonder focuses on August “Auggie” Pullman, a 10-year old who’s been home-schooled by his mother Isabel played by Julia Roberts. Auggie is not like other 10-year olds he has facial deformities which cause people to stare at him and make cruel jokes. The story focuses on the first year at middle school where Auggie, where he crushes the science tests and makes new friends. Julia Roberts is wonderfully restrained as Isabel and Owen Wilson as Auggie’s father Nate is perfectly complementary as he brings a lightness to the proceedings. Izabela Vidovic as Auggie’s sister is also brilliant in her supporting role. Jacob Tremblay who blew the audiences away in 2016’s Room is beyond brilliant in this movie. You feel every emotion Auggie feels. You feel your eyes well up when the other kids are mean to Auggie and he retreats to his room and puts on his Astronaut helmet and you feel a catch in your throat when Auggie makes friends and experiences things that any normal 10-year old should. The other stand out for me is Noah Jupe who plays Jack Wills Auggie’s best friend – this kid is destined for stardom there is a natural ease about him and he lights up every scene he is in. The thing that stood out for me with Chbosky’s Perks was the sensitivity with which he treated all his characters. Given that he was adapting his own novel you’d expect him to do a fantastic job. But it is testament to Chbosky’s commitment to telling organic authentic stories that he incorporates the small details that make the movie stand out. The moment Jack Will’s mom tells Jack about why it is important for him to take Auggie on the tour of the school is why R.J.Palacio wrote the novel in the first place. The story telling from the different points of views, the focus on kids more than the A-list adults and the natural ease with which the kids seem to come alive on screen is a rare gift. Most talented directs have a maxim – never work with kids and dogs. Chbosky is the exception he seems to extract the best out of the kids and also Daisy the dog. Every single scene delivers an emotional punch without being manipulative. In an almost faultless movie the Miranda story seems a bit of a throw-away. It is a wonderful story arc no doubt – but what might have been greatly fleshed out in the novel itself seems a bit contrived and rushed on screen. But even this minor misstep is overcome by the conversation Miranda has with Auggie. Do not miss this for anything in the world! In a world full of bad news this is 113 minutes of pure unadulterated joy and innocence. We all deserve a good cry once in a while, especially when they are tears of happiness.